The Bill Douglas Trilogy (My Childhood, My Ain Folk, My Way Home) is an unearthed gem from Facets. A personal memoir of a poverty-stricken childhood a la Angela’s Ashes and How Green Was my Valley, the Scottish trilogy is an artful example of neorealism and personal independent filmmaking. Each film in the trilogy is roughly an hour long. You can watch them all at once, or spread them out over multiple nights. Each has a distinctly different flavor. The first film is the easiest to compare to Angela’s Ashes (or Hope and Glory or The 400 Blows or ...). Jamie and his brother Tommy are old enough to find magic and mischief in the world, but too young to realize how impoverished they are. Bill Douglas’ story is a lot bleaker, though. The brothers are hard-pressed to find magic. They’re more likely to make mischief, and they’re less likely to have fun doing so. They constantly fight; they are jealous, spiteful and quick to blame each other for every misfortune. Douglas’ camera is an astute observer. Jamie scrabbles in a slag heap looking for lumps of coal to take home for the stove. His meager clothes are dirty and well worn. Meanwhile, off on the horizon the camera picks out real coal miners emerging from an honest day’s work producing tons of coal, and their children of Jamie’s age, clean and fresh, run up to greet them. The editing of the film feels a little loose, but deliberately and artistically so, like Maya Deren’s Meshes of the Afternoon or Charles Burnett’s Killer of Sheep. It probably has to do with the nature of editing film rather than digitally editing electronic footage. (I have edited film, and it’s a time-consuming process that requires a uniquely slow sense of rhythm.) Conversations don’t flow naturally, and reaction shots linger longer than is strictly necessary, yet the tempo, rather than feeling wrong, feels like an artistic flourish, like a painter choosing the “wrong” color for a sky as part of a personal style. For example, at one cut, a man rides a bicycle out of the frame, presumably to continue riding down the road. But the actor thought he was out of the shot and started to dismount the bike. So when Douglas cuts to the bicycle continuing down the road, it’s a jarring jump cut. But rather than stop the first shot early for the sake of continuity, Douglas opts for tempo and leaves the mistake in place. The bleakness of Jamie’s childhood is so deep that you almost sense that Douglas is deliberately thumbing his nose at films like The 400 Blows, in which poverty doesn’t necessarily make life worse because of the magic in youth. A filmic joke like that would certainly be within Douglas’ grasp, as the beginning of the second film shows. The second film opens on a wonderful joke. The very first two shots are in color (they’re the only two color shots in the entire trilogy. They come from a movie within the movie. In other words, only when the characters escape to the cinema does their world have any color. If the first film has at least the potential for magic and mischief, the second film squashes that potential quickly. In the first film, Jamie and Tommy roamed the town from their grandmother’s flat: their home base. But in an early development, the boys lose their home, and it becomes impossible to think of adventure with a gaping in place of a family. Most of the second film follows the boys — first together and later separately — as they seek, wait, and hope for someone to raise them. Their mother is alive, but the film pays her a visit and we see that she’s not able to be a mother. The state makes a perfunctory attempt to apprehend the boys, but their fear of the cops is stronger than the cops’ patience. Jamie learns that he and his brother have different fathers, which gives them each a different avenue to pursue, but Jamie’s father has mother issues of his own. The astute camera in My Ain Folk shows the cultural collapse that produces such desperate childhoods. It doesn’t oversimplify or point the finger, but it does look closely at the outwardly spiraling circle of failed responsibility. At each step, there’s yet another failure and the camera keeps looking toward the next circle out, searching for the adult whose motto will be “the buck stops here.” We know it has to be somewhere because we know that Jamie eventually becomes the filmmaker Bill Douglas, but we spend all of the second film searching in vain. The third film finally gives the audience some closure. Ironically, it’s the least satisfying of the three films. It’s really two films; the first half concludes Jamie’s childhood, and the second half jumps to his service in the foreign legion. The two mismatched halves make it seem like Douglas had painted himself into a corner. The natural ending to a trilogy like this would be Jamie’s rebirth as a budding filmmaker, but to get there, Douglas has to fit a lot of his characters’ lifetime into not very much screen time. Still, Douglas finds his ending. Where the first two films were bleak and bleaker, My Way Home offers a small measure of hope through the blossoming of a gentle and fragile soul. Jamie is older now. In the first half he has some luck finding a home, thanks to the welfare institutions of Scotland. Unfortunately, after the emotional scarring he received in the second film, he doesn’t know how to appreciate what he’s finally got. At a boarding school, Jamie finds himself mis-projecting his jealousy onto the one kid in the school worse off than he is, because that kid gets more sympathy from the headmaster. And when he is finally offered a decent foster home, he’s unable to trust the adults who take him in. He’d rather steal an apple from his foster family than sit down to a meal with them. Douglas conveys the awkwardness visually by staying focused on Jamie. The adults in his life are invisible, like the adults in the Peanuts cartoons; you never see them and it doesn’t really matter what they’re saying. In the second half, Jamie marks time in Egypt as an enlisted man. In the service, he becomes acquainted with literature, art, and culture, largely with the help of his mentor and new best friend who would go on to become the love of his life. The single extra feature is a good documentary called Bill Douglas: Intent on Getting the Image. The documentary was made in 2006, 15 years after Douglas’ death. The best information comes from Peter Jewell, his lifelong friend whom he met in the service. 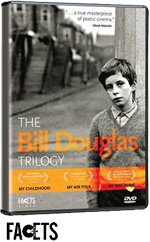 The documentary covers Douglas’ childhood superficially — after all that’s what the trilogy was for — and goes into more depth on Douglas as a man and as a filmmaker. What the documentary does not do is analyze Douglas’ work critically. There may have been a scholar or critic among the talking heads, but the documentary doesn’t try to explain what Douglas did well, or where he might reside in the pantheon of cinema. That’s left for the viewer to decide. The trilogy shows its age. No doubt the cleanest print was used for the transfer, but it’s not what you’d call “pristine.” Nevertheless, there are brilliant and breathtaking shots of small-town Scotland and the surrounding countryside. You’ll know after the first film whether Bill Douglas is your cup of tea. If so, watch the second and third parts. Watch the extra feature if you want to know more about the filmmaker. Skip to the last chapter or two if you just want to learn about the fourth and final film made by Douglas, a feature film called Comrades that appears to be unavailable on home video.